Yatra story begins somewhere in 2003 when YSR, then Congress legislative party leader, plans for a Padayatra as a last weapon to take on the incumbent TDP, and also to checkmate other contenders (for CM post) within the party. Movie showcases his padayatra, victory in general elections and ends as he takes oath as a chief minister of Andhra Pradesh in 2004. Yatra (2019) Yatra story begins somewhere in 2003 when YSR, then Congress legislative party leader, plans for a Padayatra as a last weapon to take on the incumbent TDP, and also to checkmate other contenders (for CM post) within the party. Movie showcases his padayatra, victory in general elections and ends as he takes oath as a chief minister of Andhra Pradesh in 2004..
YATRA ,movie is released in deaters ,people was mad to watch ysr in screen his biopic and how he was fight in elections and come back with a great leader ,diretor make every frame very powerfll and nice so audience give a good feed back to movie ,and runnig sucessfully in deaters . yatra movie was released ,and getting a huge hit talk ,all over ysr fans was so excited and happy to watch ysr and his nature in real life ,director make every frame very powerfull and nice ,screenplay was nice and back ground music also nice so movie get a super duper hit talk . YSR biopic was back in deaters ,peopel was very interested to watch .mammuty was done his best and director was make film very powerfull and how ever its an biopic ,audience are give best review to team .so movie was nice . 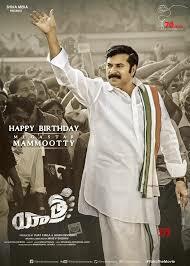 yatra ysr biopic was back in the ,movie .mammuty was nice in acting and how ever its an biopic ,ysr audiecnce will attracted ,from first show on wards movie get a huge talk and peopel watch in nice mood ,so movie was an super hit . YATRA , a great inspirational leader ys rajasekhar reddy biopic was written .director raghav was well written and the people emotional leader was born and how he started his journey and how he lead the peopel ,and he ruled 5 years AP state in best way .so movie was getting huge expectation to watch and how people was reacted to watch this biopic and this movie make sensation in this year elections so ,wait and watch on screen . Yatra' Could Have Gone Beyond Those Stock Scenes And Familiar Moments. A One-sided Film, It Lacks Nuance. ..
Yatra Isn`t A Biopic To Start With And Limits Itself To Be An Event Based Film. It Has Enough Highs To.. This Movie Will Give Everyone A Chance To Remember The Great Leader YS Rajashekar Reddy Garu. Though It Is..
First Half Of The Film Is Interesting. Second Half Has A Few Key Scenes Followed By A Nice Climax And A.. Overall, “Yatra” Is A Perfect Tribute To YSR’s Life In General. The Film Will Be Liked By All YSR’s..
Basically It’s An Attempt To Glorify YS Rajasekhar Reddy As He Was In Reality.It May Go Well With The Fans..
Director Mahi K Raghav Has Done A Good Job In Directing This Film But He Has Done A Very Mediocre Work In..
All In All, Yatra Has Share Of Its Goods And Weak Moments With Loopholes In Scripting And Execution, Lacked..
Mammootty Chit Chat With Mahi V..
Yatra Movie Team Blockbuster Meet..
Mammootty And Mahi V Raghav Chit..
Yatra Movie Director Mahi V Raghav..
Yatra Movie Pre Release Function..
Yatra Movie Pre Release Press Meet..